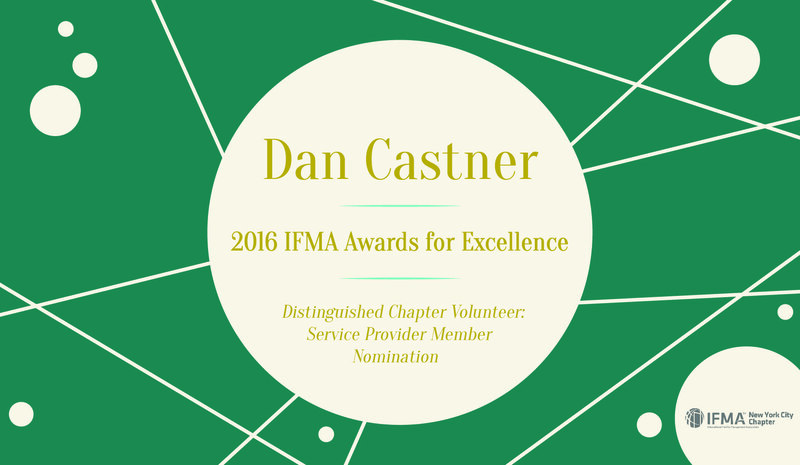 Dan was previously named Distinguished Associate Member at the 2015 IFMA Awards for Excellence for outstanding leadership within the organization at an international level. Dan’s architectural creativity lent itself to event planning, as Dan initially left his mark on IFMA by arranging a highly popular wine tasting. The fundraiser was so popular that the amount of guests surpassed the expected registration and it became an annual August fundraiser. His leadership extends to IFMA’s World Workplace conference, where Dan previously served as a seminar moderator, contributed to educational sessions and continuously highlights specific conference topics to influence local chapter events. His dedication to IFMA led to his position as Vice Chair of the Programs Committee, allowing him to work closely with the Chair to shape the educational, social, and fundraising events throughout the year. Dan is spearheading a collaboration between the Hudson Valley and New York City Chapters, offering several programs to benefit members outside of the New York City region. The IFMA Awards for Excellence will be held on January 26, 2017 at an awards ceremony and dinner hosted by the New York City IFMA Chapter. Register to attend the IFMA Awards for Excellence here!